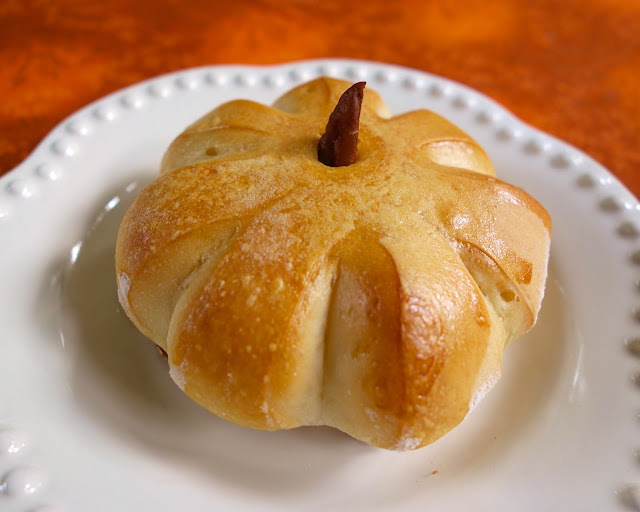 Pumpkin Shaped Rolls - transform frozen bread dough into festive holiday dinner rolls. 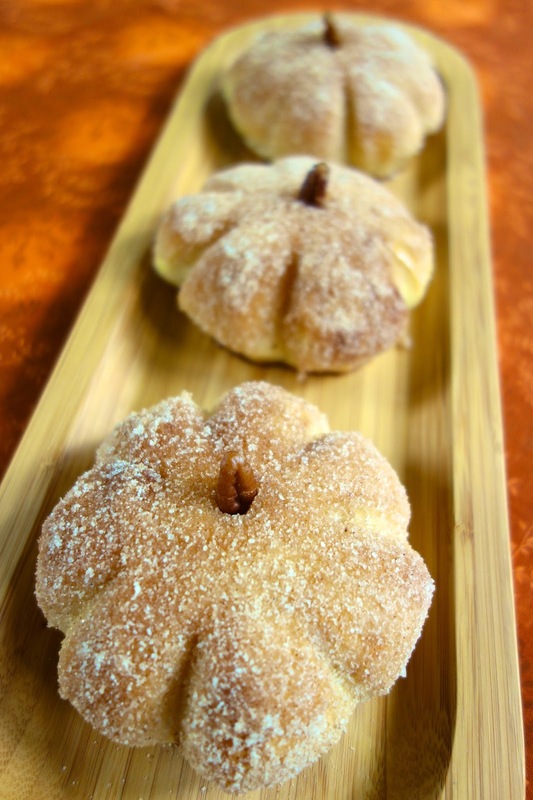 Can roll cooked pumpkin shaped rolls into butter, pumpkin spice and sugar for delicious breakfast rolls. SO easy and PERFECT for Thanksgiving dinner! Aren't these rolls the cutest thing ever?! The best part about these rolls is that they are SUPER easy to make, but that can be our little secret. I saw a recipe that made homemade pumpkin dough and then shaped the rolls into pumpkin shapes. I decided to take a big shortcut and use frozen bread dough. These rolls are a great way to let the kids help with the Thanksgiving dinner. They are seriously that easy! I made these rolls two different ways. One with just an egg wash and another dipped in melted butter and a pumpkin spice/sugar mixture. They are wonderful either way. These are definitely going to be on our Thanksgiving table! Thaw rolls. Cut 7 slits around each roll, cutting all the way through the dough and leaving the center in tact. Poke a small hole in the center of the roll. Cover and let rise until double in size. Whisk together egg and milk. Brush egg wash over rolls. Bake for 15-18 minutes, until golden brown. **Optional** Melt butter bowl. Combine sugar and pumpkin spice in a small bowl. Dip roll into butter and then into sugar mixture. Cut pecan halves in half and stick one half into the hole in the center of each roll. Steph these really are so fun!!! I have to try this for myself!! Pinning so I won't forget! Thanks Tanya! I love them! Love that these are so cute and so easy! TOO cute:) Thanks for the idea! Have a blessed day, HUGS! Pinning! Great idea! I would like to try dipping them in butter, red pepper flakes and fresh grated parm. totally doing that next time! These are precious!! I am making them tonight for practice--I'm adding these to my T-giving menu! Thanks! Can't wait to try them looks yummy and perfect for thanksgiving season! Thanks! What is the exact product that you buy at the store? All I found were Rhodes Warm and Serve (bake and serve) rolls that came in a bag of 6. They say to put them in the oven frozen. This would mean they don't have to rise. Do I have the wrong product? Was hoping to make these tonight....anxious for an answer - thanks! It is called "White Dinner Rolls" - it is the frozen dough. It comes with 36 balls of dough in each bag. You don't want warm and serve rolls. Those are already baked. You stated to thaw them...then let them rise. Approximately how long should they thaw before cutting them? LOVE this idea! I am so making these for Thanksgiving this year! It takes a couple of hours for them to thaw. You can also pop them in the microwave for about 25 to 30 seconds to speed up the process. Don't microwave them longer or they will start to cook. Thank you! I am going to go try one NOW!!! This is the cutest thing I have found this year for Thanksgiving. I always try to find something cute to add to the dinner. I think the young and old will enjoy this one! Happy holidays! How long does it take them to rise?